From a minor ding, to major collision repair, Pat's Body Work in St. Petersburg gives every job the highest attention to detail. President and Lead Technician Pat Ranieri is a St. Petersburg, Florida Native. Beginning his auto body career at Dew Cadillac in 1977, Pat has worked on thousands of cars and trucks for Tampa Bay Area drivers. 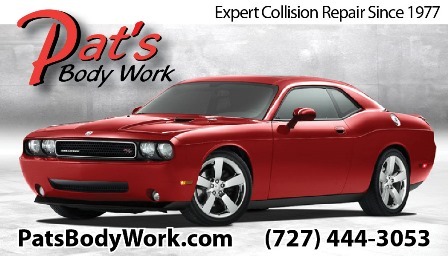 Located in North St. Petersburg, Pat's Body Work is a full-service body shop easily accessible to anyone in Pinellas County. Our customers receive a clear line-by-line estimate clearly detailing what is to be repaired and how their car will be repaired. We begin by correcting the vehicles unibody or frame and make adjustments to return your vehicle to pre-accident condition. Backed by a lifetime warranty, our auto body painters are experienced in color matching and use the finest in PPG Paint. From a minor ding, to a major collision repair, Pat's Body Work gives every job the highest attention to detail.